I will always remember the most delicious dessert I’ve ever had (my mom’s baking excluded). I was in my early 20’s and worked at a small bookstore. My finances were limited, so dining at fancy french restaurants was not something that I did on the regular. This day however, I was invited for an author lunch at a French Bistro in Vancouver. The lunch was an intimate setting, 5 or 6 booksellers rubbing elbows with author Marian Keyes and her husband. The publisher who was hosting the luncheon told us to order whatever we wanted from the menu. I ordered a Salad Niçoise for lunch and I remember feeling quite sophisticated as I ate my lunch in this gorgeous little restaurant, making conversation with people who had worked in the book industry for years. Of course the trio of crème brûlée is what I ordered, and my dessert life was forever changed. I’m now 100% addicted and whenever I see crème brûlée on a menu I have to order it. The chef who prepared my first crème brûlée experience truly was a master. Served in 3 small ramekins, the cream used in each flavor of crème brûlée had been lightly infused with a flavor– raspberry, lavender and coconut. The flavors were not overpowering at all, more the type of flavor that if you stopped and closed your eyes while taking a small spoonful on your tongue the flavors would slowly start to emerge. It was heaven. It took me years of ordering crème brûlée, to realize that it is actually quite simple to make and can be accomplished easily at home, inexpensively… even if you don’t have one of those fancy kitchen torches! I’ve recently started experimenting with using coconut sugar for my crème brûlée. Coconut sugar is a staple in my home. Many of you know that I went back to school and earned by Culinary Nutrition Expert Certification last year. The experience furthered my quest to live a “from scratch” life– making food from scratch instead of buying pre-packaged food whenever possible, sourcing the purest ingredients, eliminating preservatives and feeding my family real food. Lantic Coconut Sugar is made from the sap of organic, natural cut coconut flowers. The flavor is similar to brown sugar and in my opinion has almost a toasted flavor, making it perfect for crème brûlée. Lantic Coconut Sugar isn’t chemically altered in any way, is 100% natural and doesn’t contain any artificial colors, flavors or preservatives– making it a choice that I feel good about feeding my family when we are enjoying a sweet treat. Just because I feed my family “Real Food” doesn’t mean that we don’t indulge in delicious desserts. 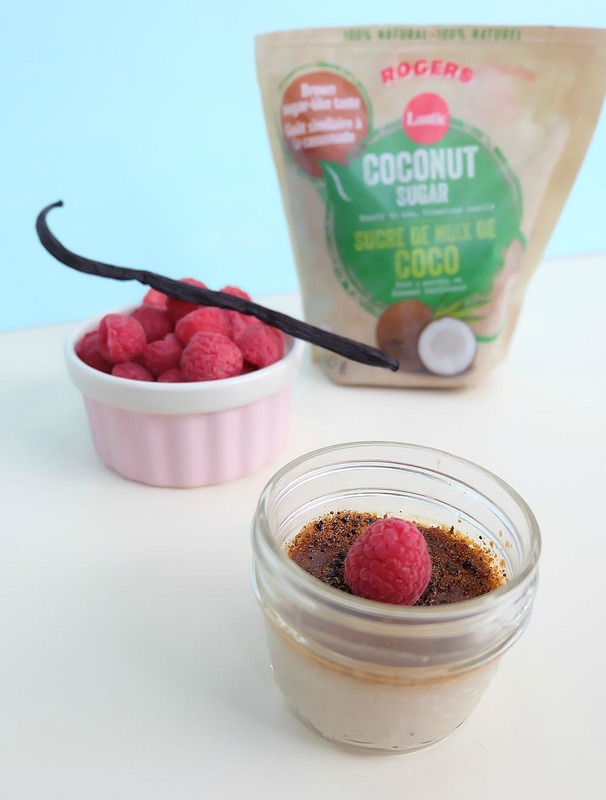 One of the things that I love about crème brûlée is that even though it looks posh and fancy, it’s actually quite simplistic and the ingredients used in my crème brûlée recipe are lovely and pure– cream, eggs from a local farm, raspberries, vanilla beans and coconut sugar. Our winter went on for way too long here in Vancouver and I’m ready for the bright, fresh flavors of spring. 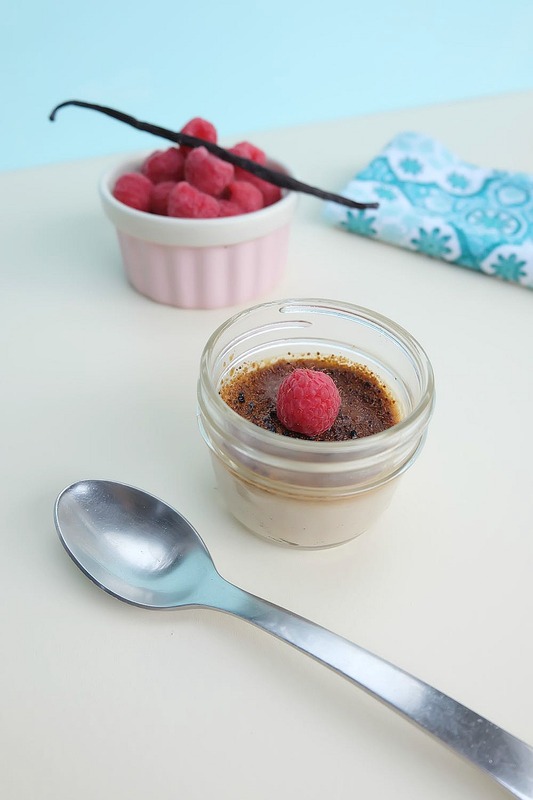 I decided to create a raspberry crème brûlée recipe made with coconut sugar for this dessert. The cream is lightly infused with raspberries that tickle the tip of your tongue. The toasted flavor of the coconut sugar pairs beautifully with this sweet, creamy dessert. You can do this! You too can make crème brûlée from scratch! It’s easy! 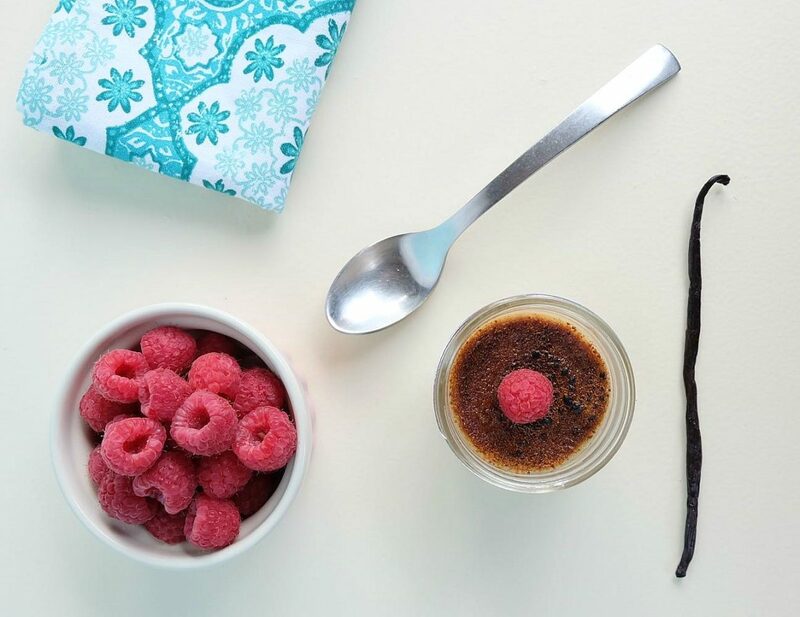 Read on for my Raspberry Crème Brûlée Recipe Made With Coconut Sugar. Step 1: Preheat your oven to 300F. Step 2: Pour the cream into a small saucepan, add the raspberries and heat over low heat for 10 minutes. Stir the raspberries and cream gently. You want the raspberries to infuse the cream, but you don’t want to mash the berries and add too much raspberry juice to the cream. Your finished cream should have a lovely pale pink color. Step 3: Pour the cream through a mesh sieve to remove the raspberries and return it to a the saucepan. Split the vanilla bean in half, scrape out the seeds and add the seeds and the vanilla bean to the saucepan with the cream. Heat on low for another 5-10 minutes. Step 4: Put the egg yolks into a medium sized mixing bowl. Add the coconut sugar and whisk. Step 5: Remove the vanilla bean from the cream and slowly pour a few tablespoons of the cream into the eggs, whisking as you pour. Slowly pour the rest of the cream into the eggs, whisking the entire time. Step 6: Pour the crème brûlée into small ramekins or mason jars. Place containers in a baking dish and pour hot water into the baking dish until water reaches half way up the containers. Place in oven being careful not to slosh water into the crème brûlée. Step 7: Bake for 1 hour. Remove from oven. Your crème brûlée will have firmed up (it will firm further as it cools) and have little bubbles in the top. Place in fridge to chill for at least two hours. Step 8: When ready to serve, sprinkle coconut sugar on top. Either use a kitchen torch to melt the sugar topping or place on the top rack in a cold oven. Turn the oven to broil and leave the door ajar. Check on the crème brûlée every two minutes rotating the containers depending on what areas are melting fastest. Remove from oven and allow the sugar to cool and harden for 5-10 minutes before serving. Serve topped with extra fresh raspberries. 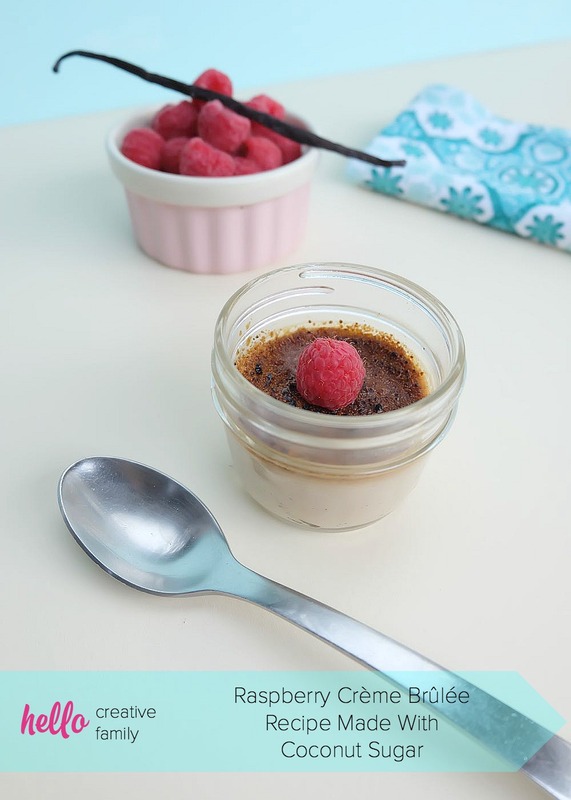 This recipe makes 4 small mason jars of crème brûlée (which is slightly smaller than a single serve ramekin). Want more? The recipe can easily be doubled or tripled! Want to give this recipe a try? 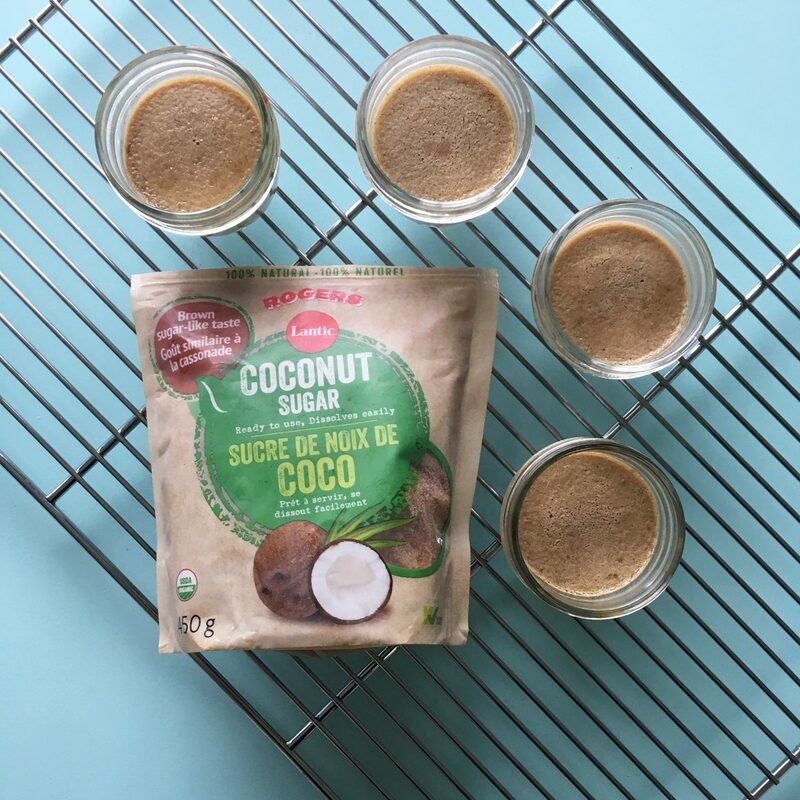 Lantic would love for you to try their Organic Coconut Sugar along with their other new nature inspired sweetener– Smart Sweetener Blend made with Sugar+Stevia. Available at Loblaws, save $1.00 off your purchase of either Lantic sugar with this coupon on Save.ca! Find more delicious Lantic recipes here! 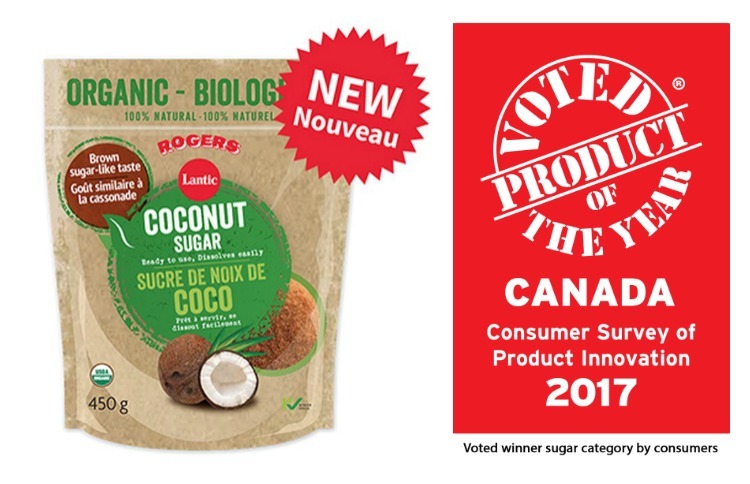 Lantic just won the Product Of The Year Award from the Canadian Consumer Survey of Product Innovation! 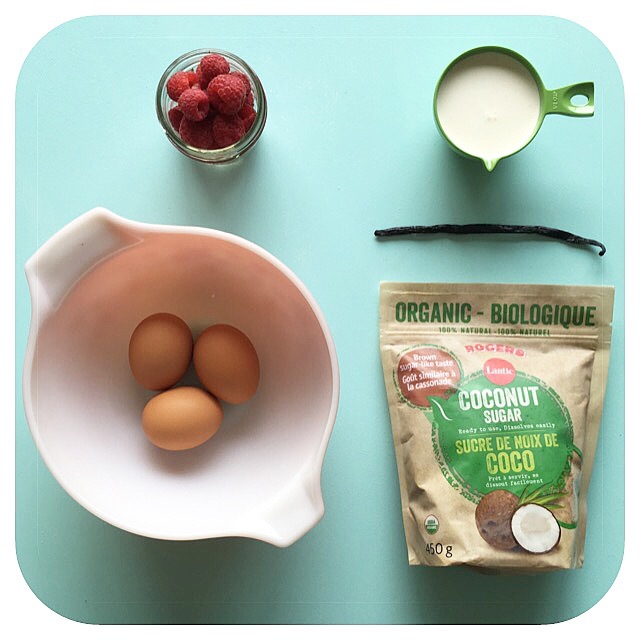 Tell me… Have you ever used coconut sugar? 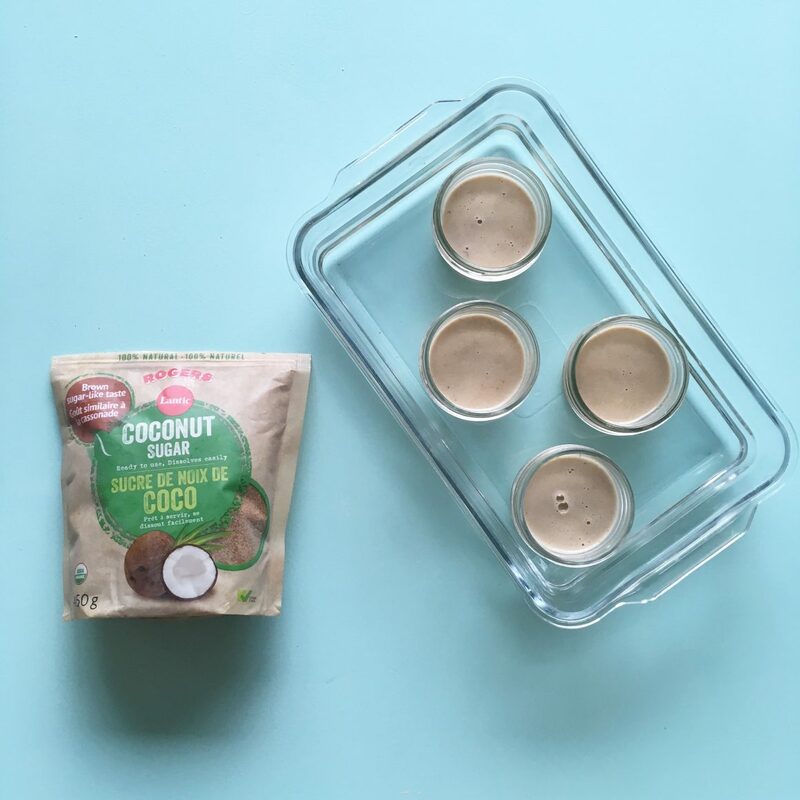 What is your favorite coconut sugar recipe? Will you try making this crème brûlée? Disclosure: Thank you to Lantic-Rogers for working with me on this post. As with every article on Hello Creative Family, all thoughts and opinions are 100% our own. You can feel good knowing that we only share products that we love! I love creme brûlée, and I’ve never tried it with coconut sugar before! 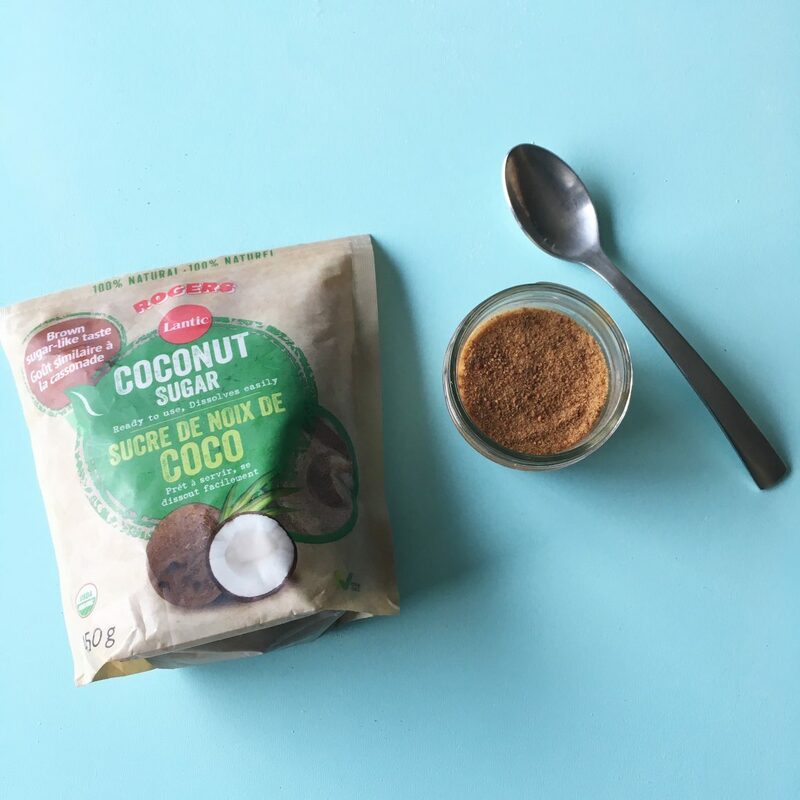 I’ve never tried Coconut sugar– does it take like coconut? Yum! I absolutely love creme brulee but I’ve never been courageous enough to try making it myself. I’m feeling inspired!! Just looks so yummy and devine ~ creme brulee and berries! You inspired me to make creme brulee for the first time ~ thanks for sharing! Yum! This looks delicious! I’ll need to try it with some of the raspberries that we grow this season! Have you ever made it with golden raspberries? I have used coconut sugar and I absolutely love it. The texture is amazing. I have to try this recipe! I’m definitely interested in trying coconut sugar! Sounds like a delicious recipe too! oh my goodness. This looks amazing! Very original and nice recipe, my dad loves creme brulee.